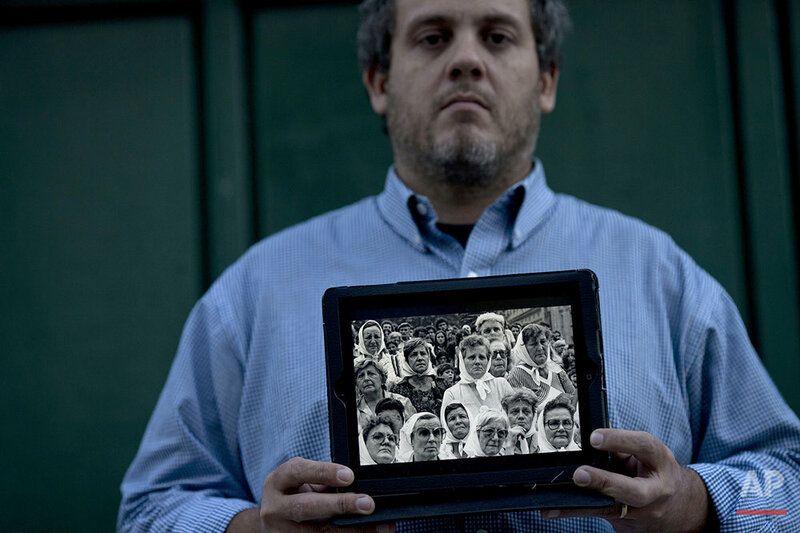 Pedro Sandoval stopped celebrating Mother's Day, Father's Day and even his own birthday after he found out the truth: The mom and dad he knew growing up had stolen him from his biological parents, who were kidnapped, tortured and never heard from again during Argentina's 1976-1983 military dictatorship. "I'm still jealous of friends who can hug or get into arguments with their parents," said Sandoval, 38, alluding to the biological parents he never met. "But I'm also thankful that I could at least hug my grandfather and grandmother." 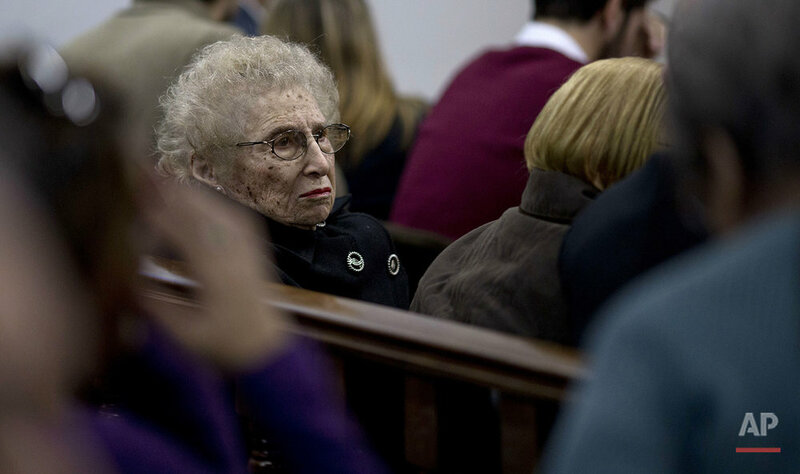 Four decades after the ruling military junta launched a systematic plan to steal babies born to political prisoners, Argentina's search for truth is increasingly focused on the 500 or so newborns whisked away and raised by surrogate families. Several hundred have yet to be accounted for. 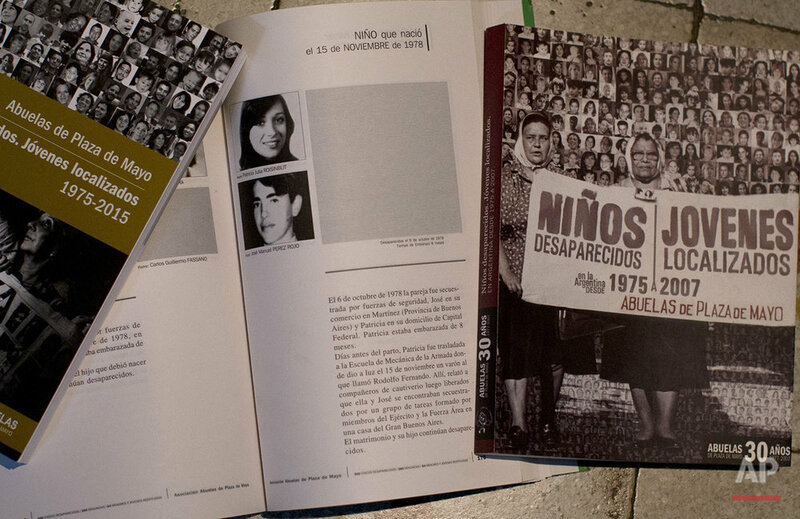 This spring a visiting U.S. President Barack Obama and Argentine President Mauricio Macri announced, on the 40th anniversary of the coup that brought the junta to power, that Washington would open up a trove of U.S. intelligence files from Argentina's Dirty War era, when an estimated 30,000 people were killed or forcibly "disappeared" by the regime. It may take a few years for the documents to be released, but the news gave families hope for word on the fate of other stolen babies. For the children who have already been found, coming to grips with the past is a painful process. Sandoval, known then as Alejandro Rei, never suspected anything was amiss growing up in a middle-class household on the outskirts of Buenos Aires. But in 2004, Victor Rei, a former border patrol officer and the man that Sandoval called his father, became the target of an investigation and his life turned upside down. Sandoval said he felt both fury and crushing guilt after a childhood he describes as full of wonderful memories. And yet like others, he was torn over where his loyalties lay: At one point during the investigation Sandoval tried unsuccessfully to protect Rei by tainting DNA samples used to identify the older man. "I made some mistakes," he said. "It was part of a defense mechanism." Ultimately DNA matched Sandoval to Pedro Sandoval and Liliana Fontana, who were kidnapped by security forces in July 1977 when Liliana was two months pregnant. She gave birth to Pedro in captivity, and four months later he was taken away. His birth parents were never seen again. "It's still tough and bizarre," Sandoval said. "But I found it beautiful that at least for four months I was in her arms." He has since severed ties with the people who raised him and has become close to relatives of his biological parents. His wife is expecting their first baby. To date, 119 cases of stolen children have been resolved. Each discovery makes for banner headlines and prompts both personal and national soul-searching. "These cases are moving because they are unique, painful and about suffering and trauma that doesn't stop," said Claudia Salatino, a psychologist who has treated some of the victims. Guillermo Perez Roisinblit, 38, was Guillermo Gomez for decades before he was contacted by his biological sister and the Grandmothers of the Playa de Mayo, a human rights group that formed in 1977 to search for the disappeared. They showed him a family picture; Perez was shocked by his resemblance to the man who would later be confirmed as his real father. "It took me 21 years to find my grandson and 15 years to win his love," said Rosa de Roisinblit, 96, who is vice president of the Grandmothers. "It was such a difficult process," Perez said, sitting next to her. 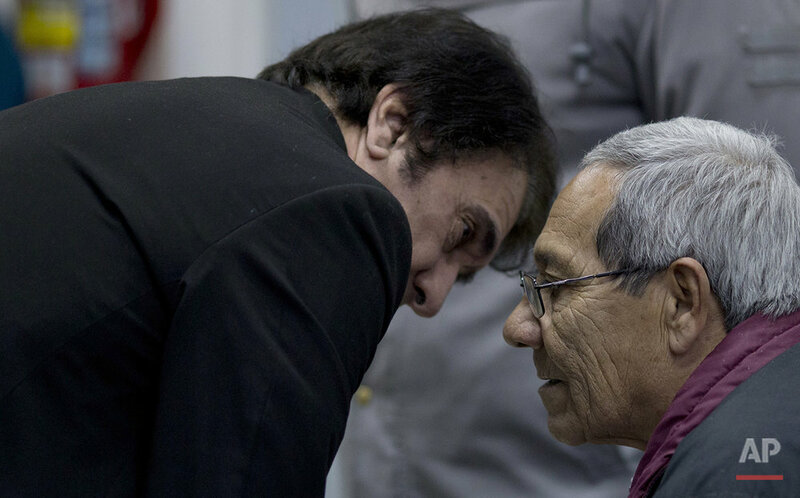 Today both are plaintiffs in a trial that began last month against the former head of Argentina's air force for the 1978 abduction and disappearance of activists Patricia Roisinblit and Jose Manuel Perez Rojo. Patricia gave birth to Perez at the Naval Mechanics School, where thousands of leftist dissidents were jailed and tortured during the Dirty War. Francisco Gomez, the man who raised Perez, served time for stealing Perez when he was an infant and is now accused in the same trial involving the ex-air force chief, who is charged in the kidnapping of Perez's parents. Perez said he visited Gomez in prison in 2003, and Gomez angrily blamed him for his confinement. "When I get out," Perez recalled Gomez saying, "I'm going to put a bullet in your forehead, in your two grandmothers and in your sister." During the dictatorship, the Grandmothers marched weekly at Buenos Aires' main square to demand the return of their loved ones. Since Argentina's return to democracy, they have lobbied the government to create a DNA database and dedicate judicial resources to the search. "They're the closest to real heroes," Perez said. "They fought against a dictatorship risking their own lives. ... And that's how I see my grandmother, as a hero." 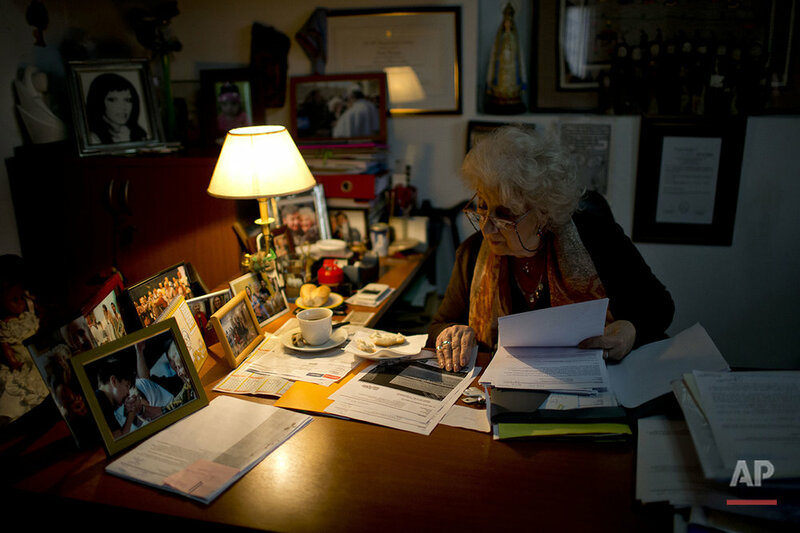 Text from the AP news story, Argentina's 'stolen babies' seek truth, face ghosts, by Luis Andres Henao and Almudena Calatrava.